First of all, thank you for you showing interest in Flemish-giant.com. Our goal is to provide all rabbit owners with a one-site-stop full of in-depth articles about specific breed and general information, in regards to all aspects of bunny-life. Included in these articles, we will cover topics ranging from over-all daily and health care, diet; nutrition, anatomy, breeding and; pregnancies, training, grooming. Additionally, we will discuss general costs and other legal obligations such as licensing and permits, plus information regarding showing, pets, breeders listings, buying and selling rabbits. All of our material and / or content is copyrighted by Flemish-giant.com. Flemish-giant.com, or the entitled Party, will reserve all rights (including copyrights, domain names, trademark rights, patents and other intellectual property rights) in respect of all information offered on or through this website, including software, audio, video, text, logos and pictures. Apart from personal, not commercial, use it is not allowed to copy, download or publish in any way, distribute or multiply information on this website without the prior written permission of Flemish-giant.com or the entitled party. It is not allowed to copy, multiply or adapt the information and/or design. The information published on Flemish-giant.com is not to be used in replacement of a certified Veterinarian. Every medication of any form has the possibilities of side-effects. Those side-effects, & the results of them, may vary greatly from rabbit to rabbit & all may be affected by various other elements such as other medications, foods, age & health, & other things. With this said, the statements here-in are not written as an absolute answer or guarantee; these are simply common treatments used by those who have experienced successful results with such, but in no way guarantee the same results for every situation. Furthermore, we do not claim to be vet’s, nor are we in any way liable or responsible for any results, be it positive or negative, due to the use of the information stated within. Use of any information offered is done so fully at your own risk. The information contained in this website is for general information purposes only. The information is provided by Flemish-giant.com and while we endeavor to keep the information up to date and correct, we make no representations or warranties of any kind, express or implied, about the completeness, accuracy, reliability, suitability or availability with respect to the website or the information, products, services, or related graphics contained on the website for any purpose. Any reliance you place on such information is therefore strictly at your own risk. Through this website you are able to link to other websites which are not under the control of Flemish-giant.com. We have no control over the nature, content and availability of those sites. The inclusion of any links does not necessarily imply a recommendation or endorse the views expressed within them. Every effort is made to keep the website up and running smoothly. However, Flemish-giant.com takes no responsibility for, and will not be liable for, the website being temporarily unavailable due to technical issues beyond our control. Flemish-giant.com, or the entitled Party, will reserve all rights (including copyrights, domain names, trademark rights, patents and other intellectual property rights) in respect of all information offered on or through this website, including software, audio, video, text, logos and pictures. Apart from personal, not commercial, use it is not allowed to copy, download or publish in any way, distribute or multiply information on this website without the prior written permission of Flemish-giant.com or the entitled party. It is not allowed to copy, multiply or adapt the information and/or design. This website and disclaimer are governed by the laws of the Netherlands. All disputes in connection with this website or disclaimer will be submitted for exclusive settlement to the competent court in The Hague. We try to do our best but we are also human who make mistakes, for any questions you can contact us. 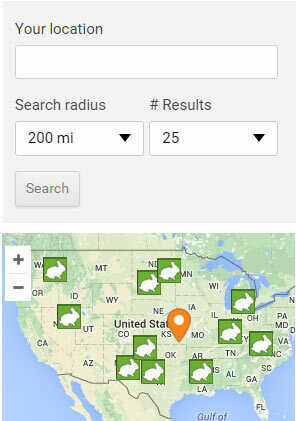 We are providing Rabbit Breeders across the world an option to publish their rabbitry in our directory. If a rabbit breeder fills out the form we always publish the following information: Country, City (State), E-mail in order to make the directory function properly. All other given information was presented to breeders as being optional. If for some reason you want your listing removed you can do so at any given time by simply using our contact form and reach out. We may use the email address that is provided to respond to their inquiries, questions, and/or other requests. How do we keep our servers online? Although Flemish-giant.com is a hobby based website we need funds in order to maintain our website. We do so by using both Google Adsense Program and Amazon Associates Program. Flemish-giant.com is a participant in the Amazon Services LLC Associates Program, an affiliate advertising program designed to provide a means for sites to earn advertising fees by advertising and linking to amazon.com. What is your favorite Flemish Giant variety? Flemish Giants are one the friendliest rabbit breeds, you just have to love them! 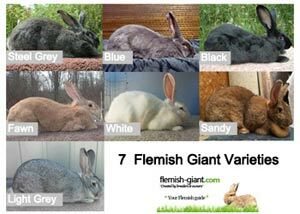 Flemish-giant.com is a website that was created by flemish owners and breeders. Our aim is to promote this beautiful rabbit breed. Flemish Giant Copyright © 2019.